Give something different. Add you own personal stamp to your loved ones present and make it memorable. Here are some ideas that might just help! Creative gifts aren’t always shop-bought. You need to put in the time and make it yourself. If you have a skill or an interest in a particular art or craft then you need to take advantage of it. What options do you have? You can make and create anything you like! 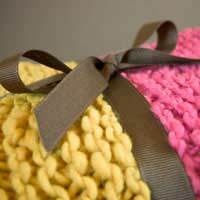 Knit a scarf and jumper embroider a special pattern, weave a rug or even make a dress in a fantastic material. Whatever your talent is put it to good use! You may have to put in some serious hours to bring it all together but your effort won’t go unnoticed! The same rules apply if you are a skilled painter or photographer. Create something that you know they would appreciate. It might be a landscape of their favourite view in the world, a self-portrait or even a picture of their beloved pet. Put together a special multi-media presentation as a gift. Here we are talking about a special video or a photo slideshow featuring the receiver and his/her family and friends. This is meant to create special memories and bring up happy emotions so make sure you put some time and effort into it. Consider what kind of music you should use as the soundtrack – is there a particular song that means a great deal to that person? If there is, make sure you incorporate it into the presentation anyway you can. This gift idea a powerful one – it will show you how much you mean to that person. Expect a few tears and definitely a big hug when you present them with this! It’s not always about creating a creative gift. If you don’t feel that you are up to it, buy some thoughtful small gifts and simply present them in a new and exciting way. Get a dozen gifts; make sure that they are small. If you are giving gifts to a girl, items like tubes of lip-gloss, mascara, jewellery and vouchers or tokens are perfect. For the boys, mini mp3 players, cufflinks and fountain pens are perfect. Then its time to get the balloons! Blow them up and carefully place each gift inside the balloon – you don’t have to wrap them because the extra paper may add bulk and make them difficult to place inside the balloon. Tie the balloons together with a big ribbon and present to your loved one with a pin – then all they have to do is burst each one to receive their gifts! It will literally be raining presents! If this all sounds like too much work and if your chosen gift simply would not fit into a balloon, there are other inventive ways you can give it to them. How about a treasure hunt? They are not just for the kids! Create a series of clues that lead them to the prize, planting a few small tokens along the way! There are no limits when it comes to being creative. You can make clothes, pictures or videos – whatever you want!